How Does Your ISP Stack Up? 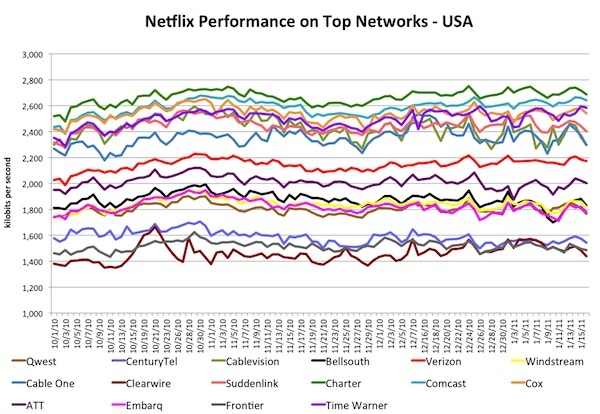 "As we continue to stream more and more great movies and TV shows, we find ourselves in the unique position of having insight into the performance of hundreds of millions of long duration, high-definition video streams delivered over the Internet." Unfortunately my ISP (CenturyLink aka Embarq) doesn't stack up very well, but I do live in a rural area of the state so the fact that I even have broadband at all via DSL is amazing to me. I used to use Hughes Satellite for my broadband service, even though it was horribly slower than what I have now it was still better than dialup. So does anyone else think this might be just a little poke towards the providers in this war of net neutrality? Then again, Comcast is right up at the top so not sure how bad they feel about this being posted, in fact I would think it would give them some bragging rights to get more sales.